New research from graduate student Grace Pitman and her professor, ecologist Ryan Norris at the University of Guelph, and by conservation biologist Tyler Flockhart at the University of Maryland has shown that egg-laying monarchs much prefer off-road farmlands present with milkweed than along roadsides. This research could have profound implications for the conservation effort of rescuing a east North American butterfly population that has plunged by 95% in the past 20 years. Each spring in North America, monarch butterflies venture north and lay their eggs exclusively on milkweed, the only plants that their caterpillar young are capable of eating. 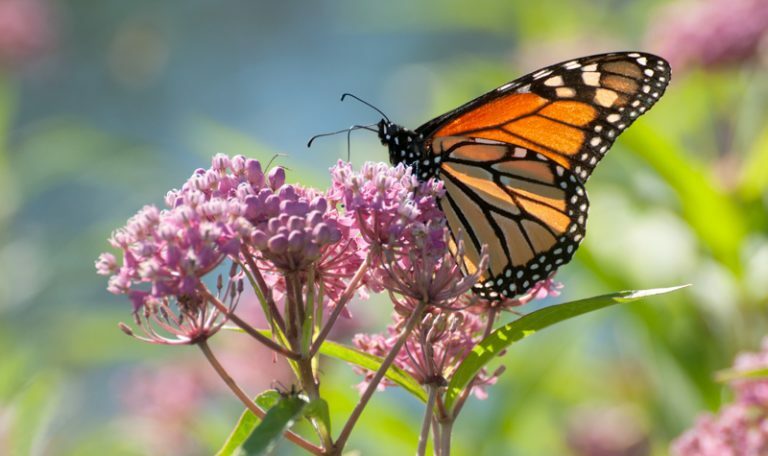 The new research has suggested that eastern North American monarchs lay three-and-half times more eggs on milkweeds located on farmlands than milkweed currently grown along roadside parks, intended to aid in monarch conservation. "These findings are significant given that there are currently initiatives under way that involve planting milkweed to help the survival of this butterfly. In some cases, the focus is on roadside planting, which based on these findings is not an ideal location," said Norris. "A more effective strategy would be to develop incentive programs with landowners to plant and maintain milkweed within agricultural landscapes."